Yellow Pages used to be the best way to find what you need. In the old days, when people need products and services they just reached for the good old phone book and checked the yellow pages. Back then, if you wanted more exposure for your business, all you had to do is by the biggest ad, and everyone would naturally be drawn to it because of its size. Of course, the large the ad, the more it costs. The Internet and Search Engines have replaced the phone book. 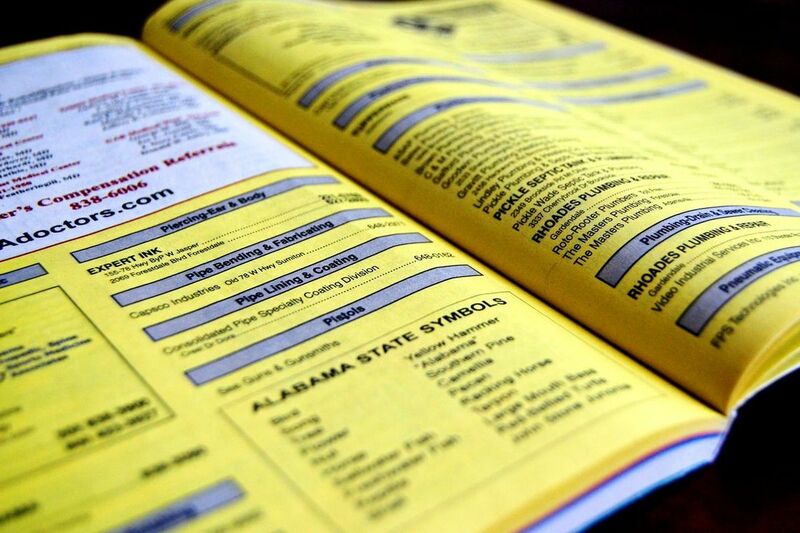 Well, the phone book day are gone forever thanks to the Internet and search engines like Google, Yahoo and Bing. Now, all you have to do is use your computer, tablet, or phone, pull up your favorite search engine, and type a keyword that best describes what you need. You will receive literally thousands of pages of search results from which you may choose. But studies has shown that people usually pick a business that is listed on the FIRST page of the results. In other words, if your business is not on the FIRST page, the odds are they will never see your listing. How can you improve your chances of being on the FIRST page? Activities designed to make sure your business is listed on the FIRST page is called Search Engine Optimization, or SEO. Effective SEO is an art, and most really good SEO firms charge huge fees to guarantee that your business will be listed on the FIRST page of search results. But really good SEO is very expensive, and is therefore cost prohibitive. Beach PC has created a new online product called the SEO BUSINESS CARD, that utilizes the two most common SEO techniques used to increase your chances of being listed on the FIRST page. They are (1) effective use of META data, and (2) link back referrals from your SEO BUSINESS CARD site to your actual website (if you have one). 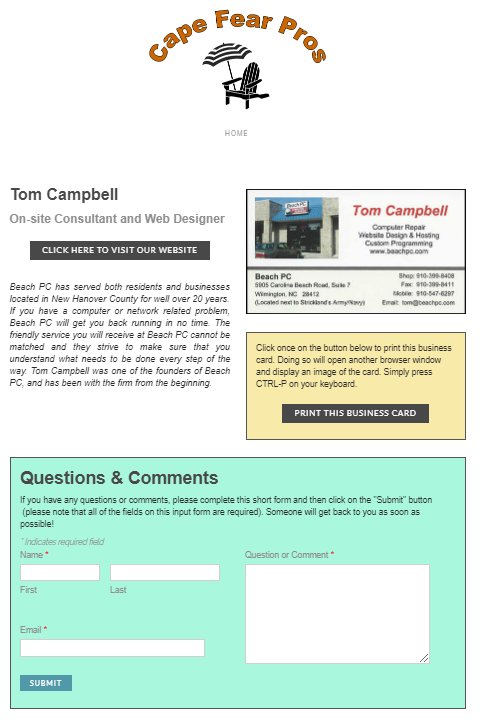 The image on the left is a screen shot of an actual SEO BUSINESS CARD that we created for Tom Campbell. We used the information on his paper business card (shown on the example) to create the SEO BUSINESS CARD. We published it under our domain entitled "CapeFearPros.com", and linked it to Tom's actual website. ​For just $10 per month, we will create an SEO BUSINESS CARD for your business. We don't make any guarantees, but we know how the Internet and Search Engines work, so we know that you will benefit from this new product. Why don't you give us a try for one month. There is NO setup fee, NO contract to worry about, and NO penalty for cancellation. To get started, click on the PayPal "Buy Now" button on the right. After you have paid $10 (plus tax) for the first month, we will contact you by email and tell you what else we need to complete your SEO BUSINESS CARD.